Scary Stories from the Attic, II - Siding, by Ron Hungarter... peeling siding, paint problems, siding, new roofing tools, do-it-yourself, tools, help, roofers, shingling, roofing tapes, diy, reroofing, layout tape, hand tools, shingled, manufactured housing, modular construction, modular, fiberglass, asphalt, contractors, help habitat, homeowner, DIY, chalk, chalk powder, construction, chalker, magichalk, permachalk, blt, shingles, tape, roofers, roofs, manufacturer, chalkers, shingled, help, equipment, log homes, THOR, free, measurements, builder, builders, chalking, contractor, contractors, lines, reveal, reveals, courses, tip, tips, tool, dormer, dormers, easiest, exposes, exposure, fastest, gable, gables, helpful, hints, hip, homeowner, installer, installing, Kingston, marks, marking, measuring, measurement, newest, safest, striking, string, save, shingling, diy's, new"
I got a call from a very prominent real estate broker. 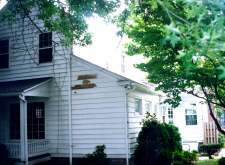 She asked me if I could come to her own home to investigate why the paint was peeling on the wood siding of her 100 year old, vintage home, and why painters were not able to keep any paint adhered to the wood siding for any extended period of time? I knew what I would find even before I arrived... a suffocating and sick home! If a person were to put a plastic bag over his head and tie it tightly at the neck, what would happen to that person? Yes, you are absolutely right! That person would die. Why? No air flowing in and out of his lungs. Homes are no different. They must be able to breath. Cut off the air flowing in and out of their attics and they suffocate and die, just like you and me. Peeling paint is one of the most common and most easily recognized signs of a sick home! Unfortunately, homeowners often get frustrated with that recurring paint problem. Physically tired of re-painting, and financially drained from this futile outlay of money, they give up. They call Sears to have new vinyl or aluminum siding installed, instead of investigating "Why" the paint was peeling in the first place. A simple solution, and end to the problem, right? Wrong! You now have a "real" plastic bag around the neck of that already sick home, and it will die even faster. (Note: New siding, house wraps and insulation board are not the problem, but they do mask the fact that major problems STILL EXIST, but go on unnoticed.) What little air may have been able to flow in and out of old cracks and crevices, has now been completely sealed off by the installation of new siding, related insulation boards, and house wraps. 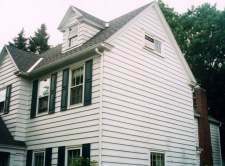 Instead of resolving the peeling paint issue to create a truly healthy home, new siding seemed like the better and easier choice. But, now you really have an unhealthy home, prone to accelerated mold growth, a build up of interior pollutants, and inefficient economies of heating and air conditioning. How do you save the suffocating person? How do you save a suffocating home? 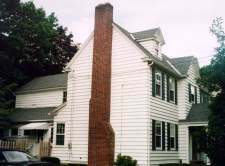 accelerated by unsatisfactory attic insulation, a newly installed roof without any vents, and a wet basement, adding significantly to the interior humidity. Yes. A wet basement. 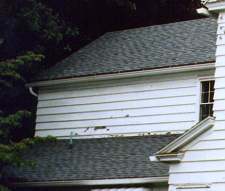 As if things were not bad enough for this old home, water infiltration from unsatisfactory perimeter drainage, gutter downspouts not extended away from the foundation, and a leaking basement entry door, further add to the wows of this suffocating home. You see, this moisture must go somewhere! If it can’t get out through the attic, it must force itself out through the walls. Yes... peeling paint! 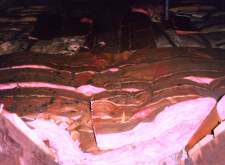 No paint on wood can withstand the problem of moisture push, aggravated by the unsatisfactory attic ventilation. 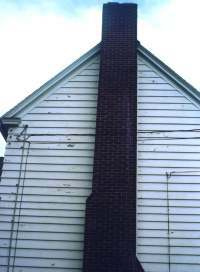 This grand old home was peeling due to suffocation caused by a lack of air flowing in and out of the attic, just like a person suffocates from a lack of air flowing in and out of his lungs, called breathing. Homes must breathe, too. How can you help a home to breathe? And, by installing functional outlet vents, allowing bad air to exit the home, getting rid of excessive heat, excessive humidity, and other interior air pollutants, too. 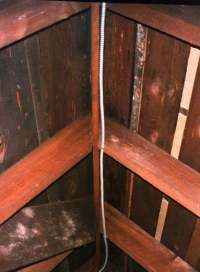 Since the unwanted heat and humidity will rise to the highest point of the home, the attic, the most logical and efficient location for an outlet vent is at the peak of the roof and is why that outlet vent is called a ridge vent. 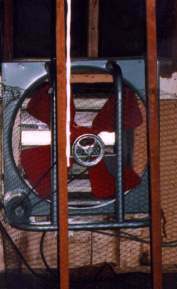 Many varieties are readily available and all will serve the needed purpose of exhaling attic air. What is one of the first things done to a sick person being taken to the hospital? With a sick home...add air flow. The more ventilation you can provided, the faster your home will recover and become a healthy home again, breathing in the good air and exhausting out the bad air, just like us. 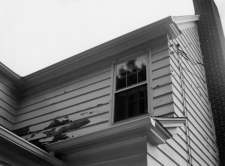 Have you just installed new siding because of peeling paint, too? Then you still have problems. Have your home professionally inspected for health related issues today! It will be money well spent. Life is too short for both you and your home, not to be healthy.